This is what the back of the transfer case looked like after the lift was installed. This month I will address another component affected by the lift and large tires installed on my Comanche; the driveline. Hopefully by now you are noticing a trend here. Installing a suspension lift and big meats has an effect on every related component and will often find your vehicle's weakest link and exploit it. If this happens out in the wilderness, it can make for a long day. My hope is to address those issues at home with the convenience of floorjacks and air tools instead of blocking the middle of the trail. After installing the Tuff Country suspension lift on my Comanche, a slight driveline vibration was present. Tuff Country includes brackets with the lift kit to lower the transfer case, however I did not want to sacrifice any more precious ground clearance than necessary. 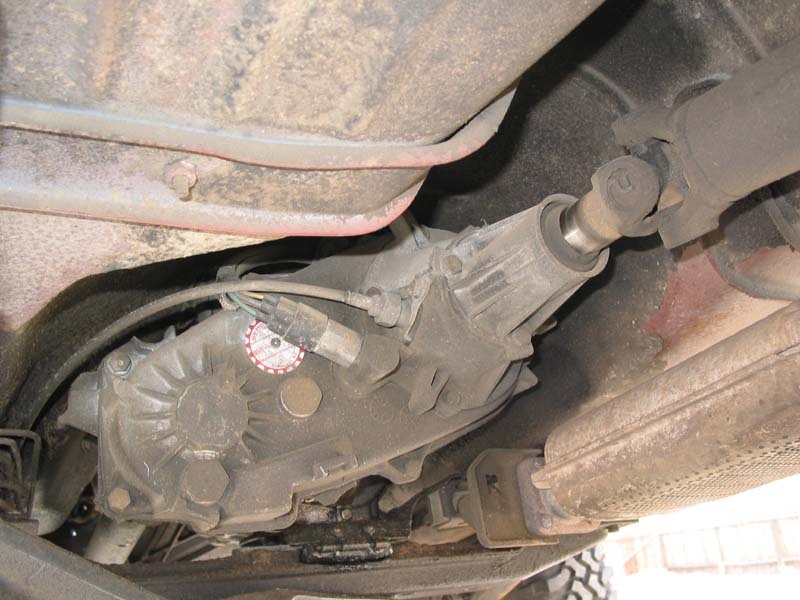 A quick look under the vehicle revealed that approximately one inch of new shaft was visible on the New Process 231 transfer case slip yoke after the lift was installed. 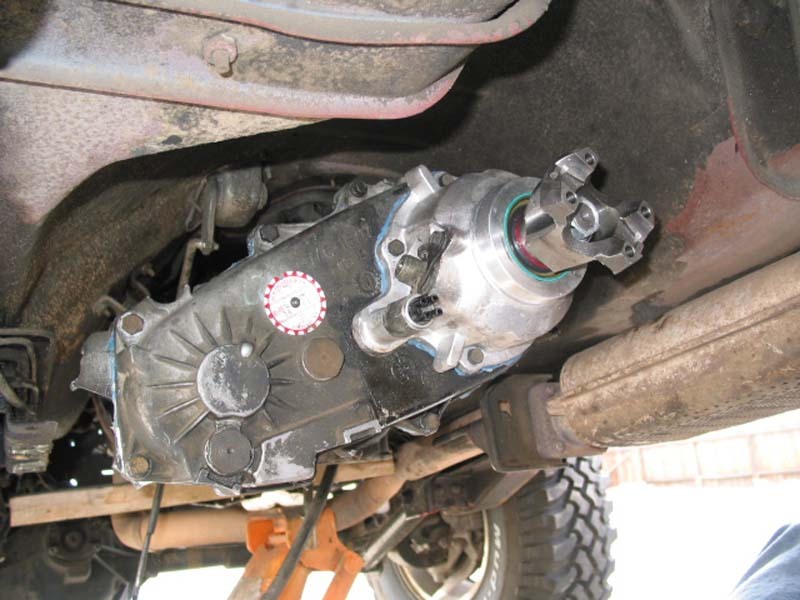 Unlike short wheelbase YJ and TJ Wranglers, a fixed yoke (also referred to as a slip yoke eliminator) is not always an absolute necessity in a lifted Comanche or Cherokee. However this product would still allow for a 3 longer driveshaft and also reduce the likelihood of damage to the environment. You see the stock slip yoke is not a sealed unit, so if it must be removed on the trail all of the gear oil will drain from the transfer case. With this in mind, I contacted two of the best known businesses in the four wheel drive community; Advance Adapters and Tom Wood's Custom Drive Shafts. Advance Adapters fixed yoke kit was chosen for a number of reasons. There are an abundance of fixed yoke kits on the market, but not all are created equal. 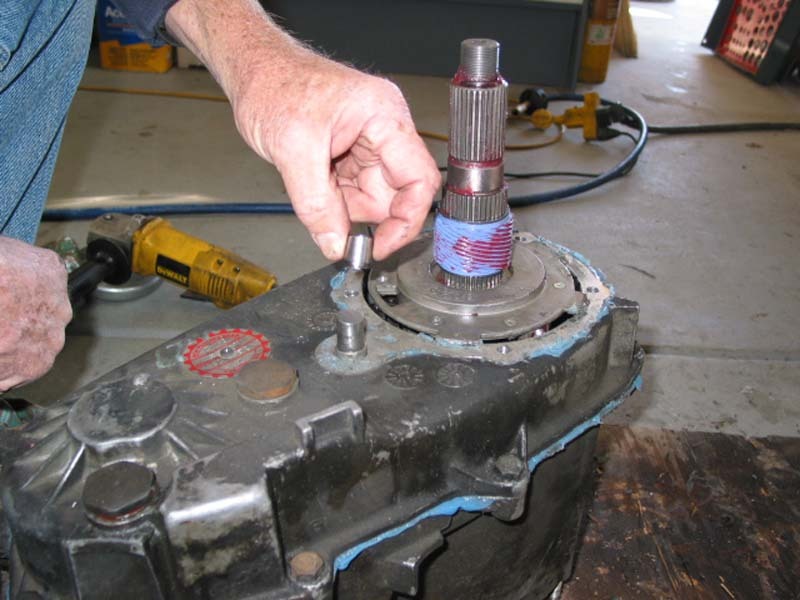 Budget kits require you to cut and tap your stock output shaft, while top dollar kits include a complete new transfer case. 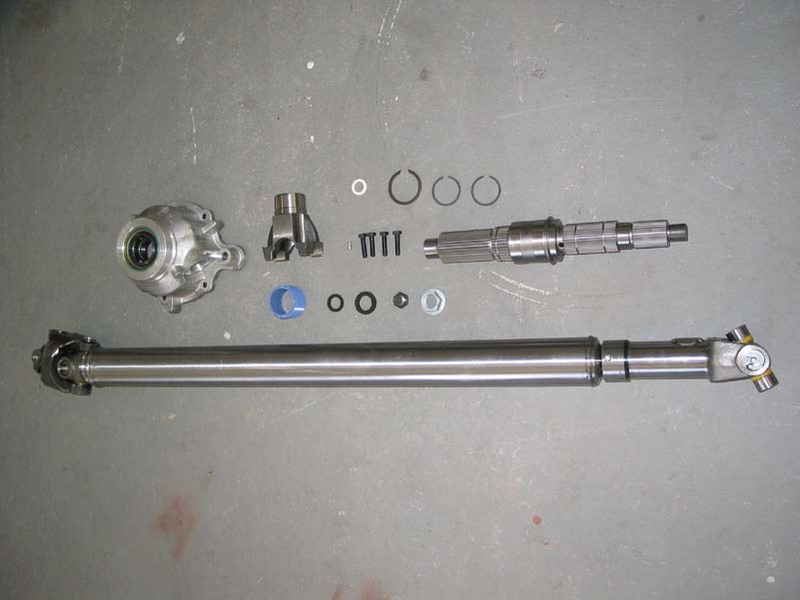 The Advance Adapter kit features a heavy duty 32 spline output shaft that is over 50% stronger than stock, but the parts come ready be installed at home by a competent mechanic. This results for lower shipping costs versus complete transfer cases and allows me to allocate my budget on parts and perform the labor myself, saving money and providing me with improved knowledge of my vehicle's drivetrain. The extra strength is appreciated, especially when combined with the 4x4 Posi-Lok that was previously installed. The Posi-Lok allows 2WD Low Range operation, transferring far more torque than the rear end than the stock configuration. 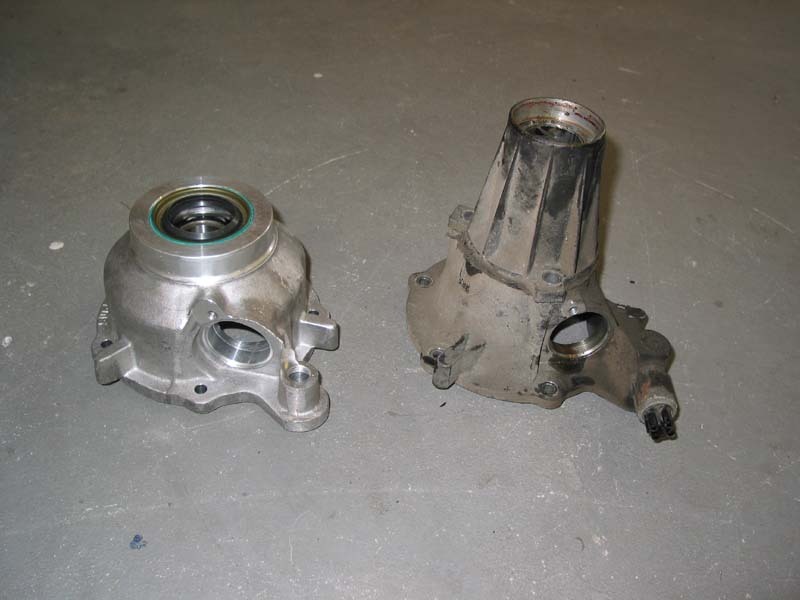 The fixed yoke is several inches shorter than the stock setup and the output shaft is significantly larger. 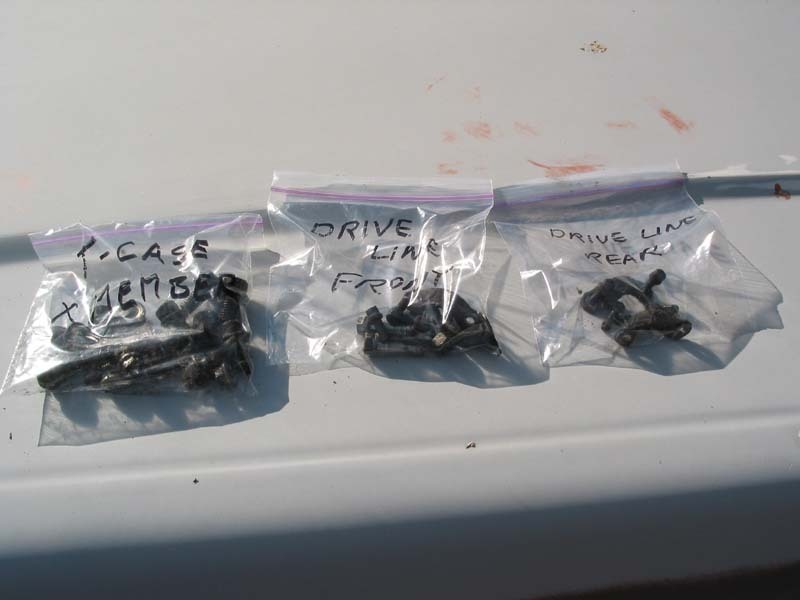 All bolts were bagged and labelled to aid in reinstallation. Begin disassembling the case by removing the tail housing. With the shorter driveline, a new driveshaft was necessary. In the past I have used local driveline shops and been disappointed with the results. Gouge marks from chucking up the driveline tubing in avise and black spray paint over old u-joints do not inspire confidence. This time I decided to skip the hassles and go straight to Tom Wood, a man whose name is synonymous with quality driveshafts. 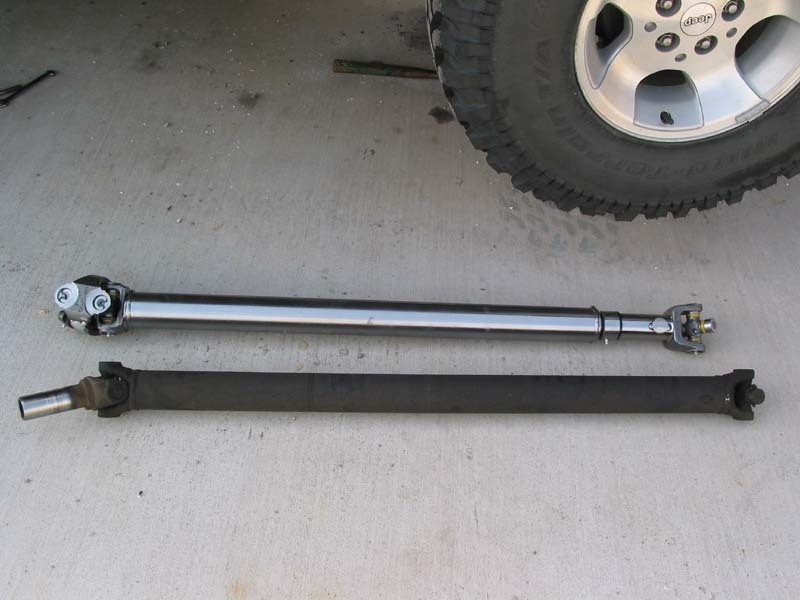 Tom regularly builds driveshafts for rockcrawling competitors and exotic projects, and that same quality and care goes into the shafts that he offers to us normal guys as well. Tom Wood's driveshafts feature forged yokes (as opposed to cast) and Gold Seal u-joints that are guaranteed against breakage. After talking on the phone for a while with Tom, he recommended that I use one of his driveshafts equipped with a constant velocity joint for the smoothest operation possible. Since I already anticipated pulling out the rear axle to regear it, adding axle shims to point the pinion towards the transfer case would not be a problem. Both the fixed yoke kit and the new driveshaft arrived quickly and well packaged, requiring me to make time in my schedule to install the shiny new parts. I spent a full day removing the stock transfer case, installing the fixed yoke, and reinstalling the transfer case. This process could likely be performed faster if you are not burdened with taking notes and pictures. As it was, downtime was minimized since I did not need to wait for a new driveshaft. I simply measured the stock driveshaft length and Tom knew exactly want length to make the new driveshaft to account for the fixed yoke. This makes this modification perfectly suited to daily drivers (such as my Comanche) who cannot afford to have their vehicle out of commission for long periods of time. With the case apart I checked the chain to make sure that it was not loose. Approximately one inch was removed from the shift rail with a cutoff wheel and angle grinder. I began the installation by pressure washing the undercarriage of the vehicle and laying out all of the components included in the Advance Adapters kit. I read through the instructions prior to turning a single bolt to ensure that I had all of the tools and parts necessary to limit the number of surprises during the installation. The Advance Adapters instructions are very thorough and offer step by step guidance. I do not intend to repeat each of those steps here, but rather add my own impressions and suggestions. 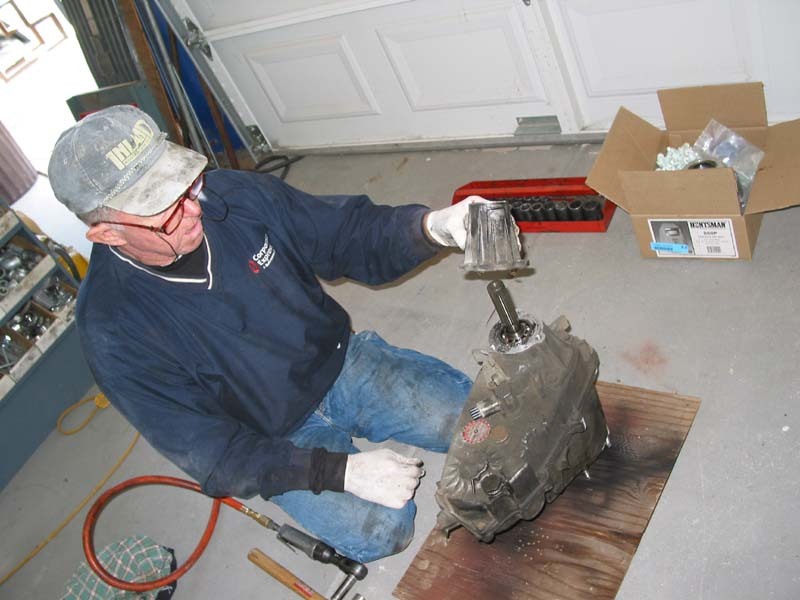 The hardest part of the the procedure was removing the transfer case, since there are a number of bolts that are difficult to access. Once the case was out, it was just a matter of partially disassembling it and adding the new components. I checked the slack in the chain to ensure that it was tight and a complete rebuild was not necessary. The only press work necessary was to remove the caged roller bearings from the stock drive sprocket, as they are not used on the new shaft. I added a new seal to the front output while the case was apart, otherwise the Advance kit was complete. One mistake that I did make was not shifting the transfer case before stabbing it back in the Comanche. NP231 transfer cases were used in a variety of applications for decades and the Advance Adapter kit is designed to work with as many models as possible. On my particular transfer case I had to trim approximately 1 off of the back of the shift fork to keep it from bottoming out in the new tail housing. 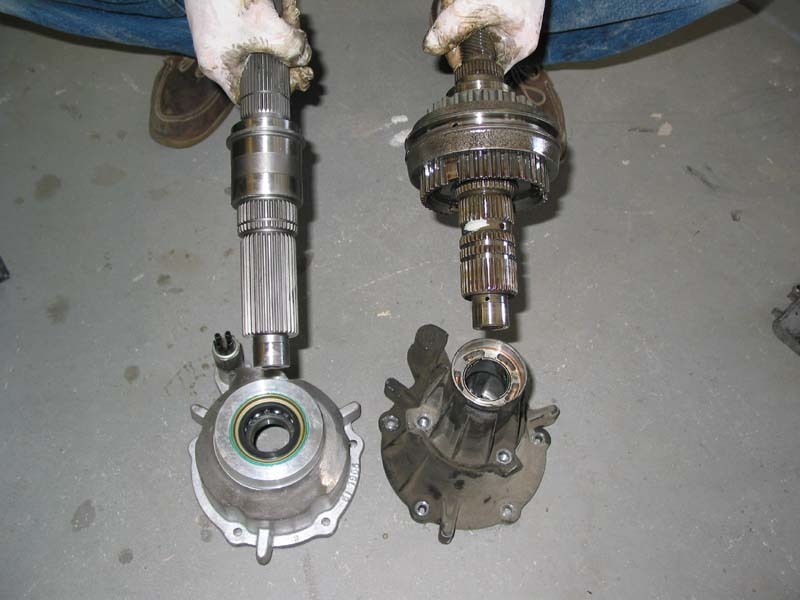 The difference between the two driveshafts is immediately obvious. With the case back in the vehicle you can hook up the vacuum actuator, shift linkage, and speedo cable. With the transfer case back in the truck, I greased and reinstalled the front driveshaft and added the new Tom Wood's rear 'shaft. I can honestly say that this is the nicest driveshaft I have ever purchased, and I have bought from numerous different shops in the past. The first thing that I noticed was the heft of the new driveshaft, it weighed 22 pounds, a full nine pounds more than the stock shaft! With the addition of the 3 degree shims under the rear axle, all of the driveline vibrations are completely gone. The end result of the fixed yoke kit and new driveshaft is a drivetrain that is stronger and runs smoother for improved reliability and comfort with no real drawbacks. Exactly the kind of modification that I intend for my Comanche.